Include:5 pairs. Shown in Picture.. Sole Length: 3.6 - 4.8 inches; Strechable for better fit, recommended for babies between 12 - 24 months. Pefect choose when children play at home and indoor playgrounds. 6 PAIRS ADORABLE AND STYLISH: Baby Girl Mary Jane Socks Featuring Non-Skid / Anti-Slip Bottom, keep little toddler safe on hardwood floor, Perfect for a beginning walker or little one on the move. STRAP ACROSS THE TOP DESIGN: The socks have a cute little strap to help keep the socks on. The strap is a comfortable fit too. Tight enough to keep them on. SUITABLE FOR 1-2 YEARS OLD BABY: Sole Length: 4.33 inch. Great Grip for Hardwood Floors - Light Weight and Durable - Excellent Slipper or Shoe Replacement or Addition. 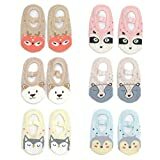 PRACTICAL BABY SOCKS: Non-Skid baby animals socks use as photography prop and costume, for casual daily wear, birthday party, baby shower, wedding party, chistmas and so on. YENZAT GUARANTEE: If you have any suggestion or questions, please don't hesitate to contact us first, we will try my best to solve it for you. we guarantee 100% replacement or refund if you are not satisfied. Yenzat Baby Girls Non-Skid Slip Socks Grip Toddler Boys No Show Mary Jane Socks Infant 12-24 Month 6 PairsThe cute Anti Slip Mary Jane Socks are the perfect addition to any outfit, and very adorable with a variety of outfits and colors.Safe non slip bottoms make them the best choice for your any little girl.Great for all surfaces - Indoors, Outdoors, Wood Floors, Playground, Day Care and Play Areas.When your baby first starts to walk, you can rely on these gripper skid free socks to be comfortable and durable.These great baby Anti Slip Mary Jane socks have good elastic, very practical for the rapid growth in babies.The cute cartoon animal are sure to stimulate babies and draw their attention to those little toes.Specifications: Material: 82% Combed Cotton, 15%Nylon, 3% Spandex Size: Sole Length 4.33 IN, Suitable for baby girls boys 12-24 monthsPattern Type: Cartoon Animal - Fox, Bear, Deer, Owl Color: Blue, Grey, Dark Grey, Pink, Yellow Shipping List:6 Pair of socksNOTE:1. As different computers display colors differently, the color of the actual item may vary slightly.2. Please allow slight measurement deviation for the data.Customer service:Our goal is to make our customer100% satisfied with our goods and service. we will 100% refund if you are not satisfied with the items. The grippers at sole of socks provide superb grip for fall prevention while walking running on slick surface such as wood floor,tile floors. Material : 92%cotton+5%nylon+3%spandex.Medium thickness available all seasons. Size and dimension details available see in 2nd figure, Great support for girls Infant baby toddler 2T 3T 4T 5T. There are several with 12-designs in the package such as cartoons animals ruffles lace striped so that's favorite for baby girls. This are "New product&designs on may 2018". 82% combed cotton, 15% polyester, 3% spandex. They are Non Skid to Keep Baby Safe from Sliding.Made of a Cotton and Spandex blend.Soft and Breathable.The Stretch of These are Nice not too Tight and Does Not Over Stretch.. GIFT SET:This is 6 pairs pack;White/Black/Light Grey.Simply adorable and fashion.Every baby girls/boys love them..
Quality is important--especially when it comes to children. If you have any problems with our socks, please let us know and we would be happy to work with you to resolve the problem. We hope you enjoy your purchase. Anti-slip design for infant baby to wear at home.Anti-slip socks is the protector of your child.Have good elastic - very practical for the rapid growth in babies ATTENTION Boot Leagth between two pairs of the same size socks will be not same maybe,Because of the elasticity of Spandex or the density of textile and so on.The length of the difference is normal within 0.4 Inch. Customer service: Welcome to Epeius,100% easy replacement or refund if you are not satisfied with the items.Pls contact us first.Thank you. The grippers at sole of socks provide superb grip for fall prevention while walking running on slick surface such as wood floor, tile floors even on the lawn..
Material: 93% Cotton, 5% Polyester, 2% Elastane, medium thickness available all season.. Size: 0-9 months/ 9-18 months/ 18-36 months/ 3-5 years/ 5-7 years/7-9 years. Size and dimension details available see in 3rd figure. There are several patterns(12 designs or 6 designs) in the package, which is a favorite for girls.. Ideal gift for your daughter, granddaughter and your friends' baby girls toddler gilrs little girls. 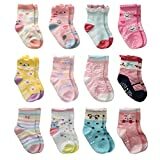 Best baby socks girl, toddler girl grips socks, non skid socks for kids- Great for the little feet!. 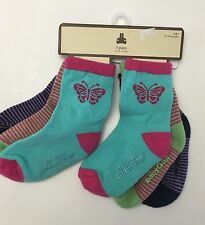 Use of high quality knitted fabric is not torn or deformed to even wash by washing machine..
Cottock baby girls socks toddler girl non skid cotton socks with grip- Protect your baby's feet in style with 6 or 12 pairs of our nonslip socks that come in cute, fun, and colorful designs.- Select finest cotton material for making your baby comfortable everyday. Breathable cotton feels soft against even the most sensitive baby's skin.- These toddler socks with grip can prevent our baby fall off on the smooth floor, not fret about slipping in the kitchen or bathroom.- The kids socks will keep little toes warm in style. Suitable for spring, summer, autumn and winter.- Super cute socks is a perfect gift for your or friends' baby on Christmas, Children's Day, Birthday. These baby socks which have good elastic, stretchable are very practical for the rapid growth in babies.- Quality is important--especially when it comes to children. If you have ay problems with our socks, please let us know and we would be happy to work with you to resolve the problem. We hope you enjoy your purchase! 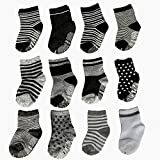 ShoppeWatch 12 Pairs Unisex Baby Toddler Socks in assorted colors and patterns. Designed with Anti-slip dotted bottoms, these socks prevent falls and slips from smooth marble or wooden floors. These lovely socks allow plenty of room for those little infant feet to grow and are perfect for crawling/walking toddlers. Size fits from 12 - 24 months and upto 36 months (12 - 15CM). Material 85% cotton / 15% nylon sweat absorbent. Machine wash with warm water and tumble dry low. Do Not Bleach and Do Not Dry Clean. A perfect gift item for expecting mums or your own baby! 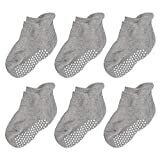 Features:12-Pair Pack Gripper Socks in Pastel Colors And Cute Assorted Patterns for Girls.Soft Baby Socks with Grippers for toddlers.Light and breathable Cotton / Nylon material with White-dotted skid proof bottoms.Perfect gift-giving item for baby-showers for the mum-to-be!Suitable for Infants 12-24 months up to 36 months babies and toddlers. 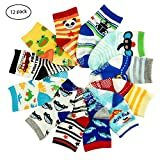 12 Pairs Assorted Baby Non Skid Ankle Cotton Socks. Including 12 pairs different pattern socks..
Material: 95% Cotton, 5% Nylon. Very comfortable soft and warm. Machine washable, easy cleaning.. Size: Frame feet of sock: 3.7-4.7 inch, Suitable for baby are 6 months-2years..
Stretchable: Good elastic, these baby socks with grip are very practical for the rapid growth in babies. Fit for boys and girls.. Wide Applications: Perfect gift for new parents, new grandparents, friends, family, co-workers, baby shower gifts, christmas present or for any occasion.. Gender neutral baby anti slip sock are suit for toddler walker boys and girls, they are very nice gift for baby shower baptism,thanksgive day christmas gift. Bay non skid sock materail: 85% Cotton, 10% polyester fiber, 5% Spandex. Baby socks with grips size: Aprx 4.7 inch, Suitable for 10-36 months. These baby anti skid socks are safety for walker, stripes cartoon style baby boys gap socks,Gripping soles lets your kids wear the socks around the house without your having to worry about them slipping and falling. 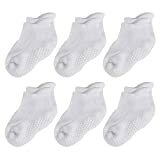 12 Pairs baby sneakers foot socks packed. Baby alway need many socks to replace, so this gentra neutral 12 packs baby walker socks are best choice to order and we have 100% quality guarantee very good customer service..
High Quality Baby Socks Anti Skid Moderate Thickness Perfect for All Season.Not too thick or too thin. Keep Warm ,Breathe freely, absorb sweat, odor resistant.. Size: 12/18/24/30/36 months 1-3 years. 12 Pairs Packing.Ultimate Comfort Baby Skid socks! ouch Soft,Have good elastic. Anti-slip on the bottom side to prevent baby slip when they start to learn walking.. FULLY COVERED DESIGN:Keep your children's feet clean! Stay dirt-free and prevent blisters whether its playtime or bedtime.. GUARANTEE FOR 30 DAYS: If you are not completely satisfied with your purchase, we will refund your order with no exception..
Elutong is a world famous brand specializing in different design high-quality outdoor sports products, such as infused water bottle, sun hat,yoga socks, gym gloves etc. "Bringing you a healthy and happy journey" is our principle. Welcome to choose a suitable product from our store. 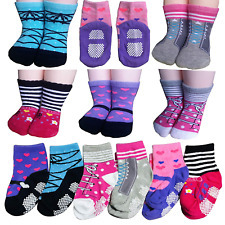 Elutong Baby Non-Skid Socks Specification: Size: 12-36 Months Kids, Stretchable, Elastic anti-slip socks Package:12 Pairs Baby Anti-Skid Socks Advantages: The socks are stretchable, which provides room for growth. Elutong Baby Grip Socks are the perfect everyday sock for children. Designed with a non-slip, breathable fit and a functional grip pattern, these cushioned socks are perfect for a baby's first steps or toddlers running around the house. The Grippy Part of socks can prevent your kids from the hardwood floor,the tile floor, the linoleum floor, the laminate floor and kitchen floor when they learn to walking,running. For season: Spring, summer, and autumn. 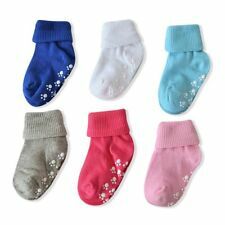 ( warm winter, not for very cold winter) These gender baby girl or baby boy non-skid ankle socks are very comfortable, it can wear outside, home, indoor, outdoor freely without shoes. These toddler socks with grip can prevent your baby fall off on the smooth floor, no worry about slipping in the kitchen or bathroom. Note: We suggest that machine washes in cold water or water temperature not above 30°C / 80°F on the gentle cycle in mild detergent. Do not bleach/dry clean. Warm iron if needed.the water temperature under 30 ℃ when washing. Warranty: Elutong provides 30 days free return without any reason and lifetime technical inquiry support. If you have any questions, please do contact us. We will reply you within 24 hours. Please NOTE that warranty is only provided when you purchased from Elutong Direct, no guarantee for other unauthorized sellers.